Autumn is an ideal time to travel to Toronto and other Eastern Canada destinations, like Ottawa and Montreal for so many reasons. There's a crispness to the air that warns winter is around the corner yet temperatures do not dip into the freezing range. This change in temperature gives vigor to the city, reminding its people that they better make the most of the weather and enjoy outdoor recreation before winter sets in. Aside from Thanksgiving, which Canadians observe a month earlier than their American friends to the south, October is mostly a month in which Torontonians continue to enjoy the outdoors by hiking, biking, relaxing on patios, and boating. Those with vacation cottages will visit one last time and close them up for the season. Temperatures can be cool in Toronto in October, but not unpleasant. Rarely does it snow in in October—The first snow usually comes in November or December. Visitors can expect rain about 10 out of 31 days in October. Visitors to Toronto in October should be prepared for a variety of temperatures. Pack clothing that can be layered. Long sleeve shirts; sweaters/sweatshirts; jacket; long pants; closed-toe, comfortable shoes; and boots. Coat, gloves, hat. You may not need them, but you just can't be sure. In October, many outdoor activities and events can still be enjoyed comfortably with just a little extra clothing. Autumn foliage is truly one of Canada's most beautiful natural attractions. 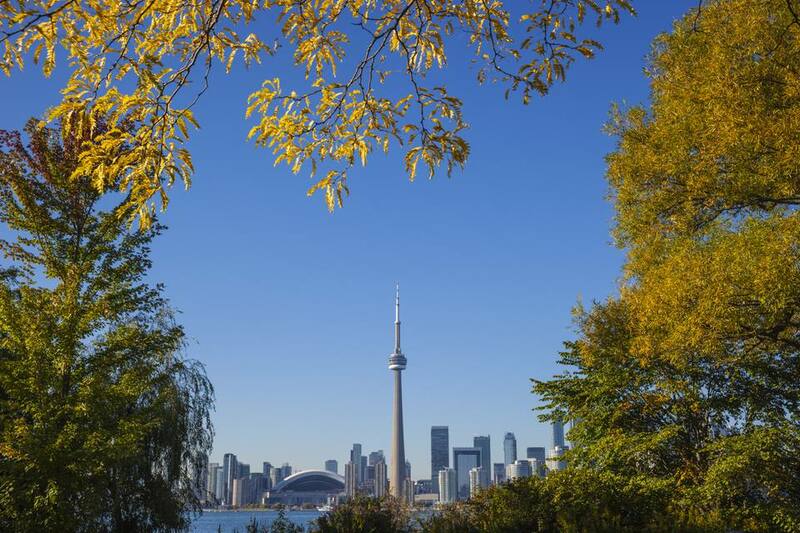 You don't have to leave the city to enjoy it; several places in Toronto have beautiful displays of fall color. You can take a self-guided walk along the Don Valley Hills and Dales Trail, one of Toronto's Discovery Walks, a program of self-guided walks that link city ravines, parks gardens, beaches, and neighborhoods. The second Monday of October is Thanksgiving in Canada. Banks and most stores will be closed. Thanksgiving Day in Canada is linked to the European tradition of harvest festivals and is centered around giving thanks with family and friends and enjoying a good meal with turkey, a roast and seasonal vegetables. October 31st is Halloween and, like in the U.S., children enjoy dressing up in costumes, going to a party or trick-or-treating in their neighborhood. Since October is Halloween month, it makes sense that the week-long After Dark Film Festival takes place at this time with new horror, sci-fi, action, and cult movies. Harbourfront Centre always offers special artistic and cultural events. October may be the opening month for skating on the Natrel Rink (weather permitting). No matter what the weather you can take in the center's Visual arts exhibitions and visit the Craft & Design Studios. Taking a walk in the Toronto Music Garden there provides visitors with an opportunity to enjoy the musically themed landscape designed by renowned cellist Yo Yo Ma and landscape designer Julie Moir Messervy. The Distillery Historic District has tours and other special events. The district is a creative blend of Victorian Industrial architecture and 21st century design and creativity. You'll find unique shops, galleries, studios, restaurants, cafes, theaters and more. Casa Loma, Toronto's downtown castle, plans special events each month. Casa Loma, first built in 1914 by financier Sir Henry Pellatt, is regarded as a treasured heritage landmark and is one of Toronto’s top tourist attractions and hospitality venues. The International Festival of Authors takes place beginning the end of October. At the event, you'll meet, hear and learn from leading thinkers and storytellers. The Reel World Film Festival, held annually in October, is "dedicated to screening and supporting the underrepresented voices of Indigenous and racialized media artists who create films for social good." Plan your visit, and pack for exploring the outdoors. Ontario and the area surrounding Toronto are ablaze in color in early October and you can take one of the fall foliage drives in Ontario. There are interesting Toronto Day Trips within an hour or two of the city that will get you out into rural areas. It's just an hour down the road, so many people visit both Toronto and Niagara Falls when they are in the area.